Bad Air and Water, and a Bully Pulpit in China. (Foreign Desk)(THE SATURDAY PROFILE) Jim Yardley. FOR the untold thousands of bureaucrats in the Chinese Communist Party, a cardinal rule of political self-preservation might be this: best not stand out too much, certainly not in public. A government official marching too far ahead of the parade of acceptable opinion runs the risk of finding himself dangerously alone. 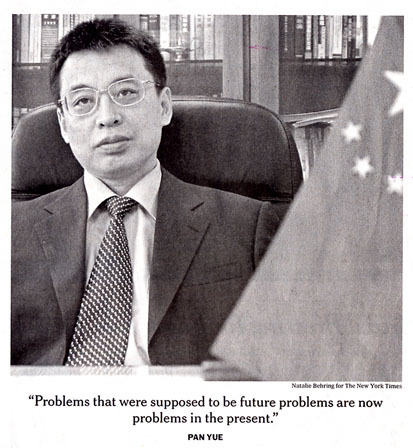 So it is always a surprise to see what comes out when Pan Yue opens his mouth, as he did one afternoon this summer at his office at the State Environmental Protection Administration. The afternoon sky was clotted with the usual soup of haze and pollution as Mr. Pan ticked off one doomsday statistic after another. Acid rain, he says, now falls over two-thirds of China's land mass. Of 340 major Chinese cities surveyed last year, 60 percent had serious air pollution problems. In China's seven major waterways, pollution is so severe that vast stretches are not suitable for fish. ''Problems that were supposed to be future problems are now problems in the present,'' warned Mr. Pan, 44, as he smoked a cigarette. If he is blunt in identifying the problems, he sounds almost radical in offering a solution: China must change the way it is developing to prevent an environmental crisis and a depletion of natural resources. Environmental protection must become a national priority. And, for good measure, public participation must be encouraged -- the sort of language that in China usually means more democracy. Well known for years in intellectual circles, the outspoken Mr. Pan has become a national figure in a country where environmental awareness is rising, even as environmental degradation is widespread and severe. His job as a deputy director of China's top environmental agency, if low on the totem pole of power in China, has given him a bully pulpit to help put environmentalism on the agenda -- apparently with the silent blessing of higher leaders. Mr. Pan, who has dark, spiky hair and looks a bit like a Chinese version of the Canadian actor Mike Myers, is quoted so often in the Chinese press that he has become the de facto spokesman of the environmental agency. If he were an American bureaucrat, he might be considered a media hound. In China, he is a rarity. ''I've always been known as a very frank speaker,'' Mr. Pan said, smiling. ENVIRONMENTALISTS in China have long worried, and warned, that a day of reckoning is coming. Historically, China has never put much emphasis on environmental protection. Yet a quarter century of unbridled economic growth has brought not only new wealth but a legacy of blackened rivers, grossly polluted skies and dwindling natural resources. But top officials like President Hu Jintao and Prime Minister Wen Jiabao have started talking about the need for environmental protection as part of a ''sustainable development'' model for the country. In speaking out, Mr. Pan seems to have sensed that the political climate is shifting. His agency lacks the political clout of other government ministries but his message is increasingly in vogue, particularly among college students and the urban elite. He came to the environmental agency in March 2003 after a 20-year government career, much of it working as a journalist at different state-controlled newspapers. The environmental agency had -- indeed, it still has -- a reputation as well-intentioned but often powerless. Its mandates and regulations are often steamrolled by ministries involved in economic development or simply ignored by local officials. Mr. Pan has called for more power for regulators. He said the current system was devised so that local environmental officials often reported only to local authorities -- not to the central agency. He said those officials often disregarded concerns about pollution to push for economic growth, at any cost. He has pushed for aggressive exploration of new energy sources, noting that China's growing dependence on coal is environmentally unsustainable. He wants tax penalties on heavier polluting industries and tax rewards for industries that conserve. And in October, environmental officials will begin preparations for trying out the so-called ''green'' gross domestic product, a new formulation that would reflect environmental costs in calculating economic growth. A pilot program in certain cities and provinces will begin next year. Whether it will all result in nothing more than a lot of words, or the beginning of real action, remains to be seen. BORN in Jiangsu Province, Mr. Pan is the son of an engineer general in the People's Liberation Army. He considers himself both a member of China's intellectual class and a government official, and his early work in the media fit neatly with his appetite for issues and debate. Yet he cautioned that the party could face social upheaval if it did not loosen social controls and promote ''legalization and democratization'' of state affairs. Even if people were ''temporarily preoccupied'' with the rising incomes brought by economic reforms, he wrote, they would eventually grow restless and demand greater political reform and openness. One solution, he argued, is for the party to promote checks and balances in political life with institutional changes like intraparty elections -- the sort of proposal now thought to be under consideration by top leaders. ''We must take a positive attitude toward promoting the legalization of the state and the democratization of political life,'' he wrote. He also published an influential criticism of the party's traditional Marxist approach to religion and called for a more accommodating attitude that would absorb believers into national life. In his latest post, Mr. Pan seems to understand the shock value of saying in public what many Chinese environmentalists, and even some officials, are saying in private. He has pushed for greater grass-roots activism and helped the environmental agency organize student groups at 174 universities. He said more than 100,000 college students across China have gotten involved in tree-planting campaigns or in cleanup efforts at the Great Wall. He said such public activism, as well as new government policies, were essential for China's future. ''There's not a third road on this issue that is available to China,'' he says.